Blevin Blectum is an electronic musician. Recently relocated from the industrial armpit of Oakland, California, to the humid lovecraftian greenery of Providence, Rhode Island, Blevin releases her fourth solo album, GULAR FLUTTER, on an unsuspecting public via the AAGOO label (New York). Blevin is one half of the recently reformed and reunited groundbreaking digital duo Blectum From Blechdom, recipients of the 2001 Ars Electronica Award of Distinction in Digital Musics (for their album "The Messy Jesse Fiesta"). Blevin moonlights with audio/video band SAGAN alongside her husband and fellow e-musician Lesser, keyboardist Wobbly, and video artiste Ryan Junell. Blevin produces continued electronics "with a more oblique slant on the basic BFB sensation of things-not-quite-right-here, clanking, creaking grooves and anti-grooves as a coal-powered spacecraft from some steampunk parallel universe potentiality, puffing and straining as it struggles to reach escape velocity, chopped, noise-reduced and timed/stretched to the breaking/boiling point, generally fucked-with samples of everything from hand-slapped rain-drenched leaves in courtship gardens and antique broken Beatnik banks to ProTooledFree classic utterly danceable disembodied-blissful-transvestite-stand-up-comic vocals". 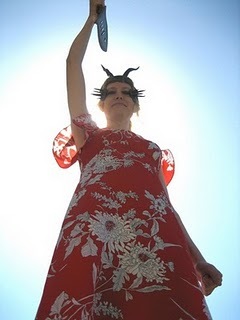 Blevin holds degrees in English and Violin from Oberlin College/Conservatory, and a masters in Electronic Music and Recording Media from Mills College. She is a licensed and registered veterinary nurse. She was the recipient of a residency at the Headlands Center for the Arts in Marin, California. She will be a composer-in-residence in August 2008 at the Kimmel Harding Nelson Center for the Arts in Nebraska City, Nebraska. She has toured extensively through the USA and Europe since 1998. In 1999 she was the winner of the 1999 New Langton Arts Music award for her first solo CD "Pirate Planets" on the Phthalo label out of Los Angeles. Her second and third albums, "Talon Slalom" (2004) on Deluxe Records, and "Magic Maple" (2006) on the Praemedia label, were greeted with much critical acclaim.